Established in 2009, the European CCS Demonstration Project Network (The Network), has been a unique knowledge-sharing effort aimed towards development and deployment of the CCS technology. The Network currently consists of four CCS projects in Europe: former Compostilla (Spain), Don Valley (UK), ROAD (The Netherlands) and Sleipner (Norway). This is the third report of a series that cover technology progress of different parts of the CCS chain, updates on regulatory developments, summary of efforts related public engagement, costs and knowledge-sharing beyond the Network. Information in this report is based on aggregate information that projects released at the knowledge sharing events as well as through the Information and Experience Gathering (IEG) survey, a Network-developed tool for knowledge sharing. 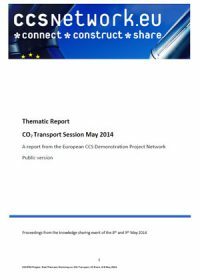 This report summarises the topics discussed at the Thematic Workshop on CO2 Transport of the European CCS Demonstration Project Network. It covers the updates from three Network projects: ROAD (NL), Compostilla (ES), and Sleipner (NO) with apologies for absence from the Don Valley Project (UK). The knowledge sharing meeting, held in Ponferrada (Spain) on 8-9 May 2014 and hosted by CIUDEN (Compostilla Project), addressed also the topics of storage and regulatory developments, covered in separate reports. 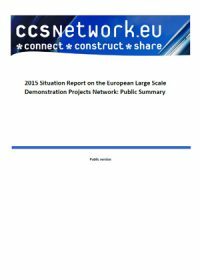 This second edition of the European CCS Demonstration Project Network: Situation Report 2013/14 includes the findings related to the participating projects from both the knowledge sharing events, presentations, and the internal survey conducted via the Information and Experience Gathering (IEG) questionnaire. The report covers progress made by the projects in capture, transport, storage, regulatory development, public engagement and knowledge sharing within and beyond the Network. Little has changed from previous reporting for the projects in terms of planning and following timelines. Almost all of them have experienced delays with various permits and with reaching a final investment decision (FID). In 2013, two projects, Porto Tolle and Compostilla received a negative FID. Ciuden, the academic partner of Compostilla project, remains however with collaborative status in the Network. The current timeline for the ROAD project suggests that they could be operating and injecting CO2 by 2017. For Don Valley project this is planned for 2018. The Network is composed of one oxyfuel power project (former Compostilla), one IGCC power project which may also include gas oxyfuel technology (Don Valley), one post-combustion power project (ROAD) and a gas processing project (Sleipner). Sleipner is the only project currently in operation. All will capture over 1 million tonnes of CO2 per annum, at a capture rate of over 90%. SOx and NOx are quoted by the projects as the most common and expected impurities in the slip stream gas. 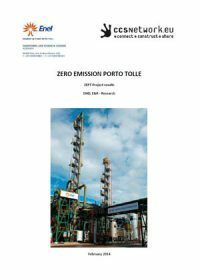 This report summarises the main lessons learnt and key findings from the Zero Emission Porto Tolle (ZEPT) project. The ZEPT project was funded by the European Energy Programme for Recovery (EEPR) during the period 2009-2013 and covered the design, procurement and construction of a demonstration CCS plant as well as the detailed site characterisation, to verify the feasibility of the injection and storage of CO2 in a safe and verifiable manner. Presentation from the Advisory Forum held 11th October 2013. 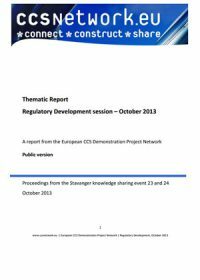 This report presents the discussions, conclusions and actions agreed at the European CCS Demonstration Project Network thematic workshop on Regulatory Development which was held in Stavanger and hosted by Statoil on the 23 and 24 October 2013. This meeting included an update from the European Commission, detailed project updates from Don Valley, Compostilla and ROAD, an update on the current policy, legal, regulatory activities within ZEP. 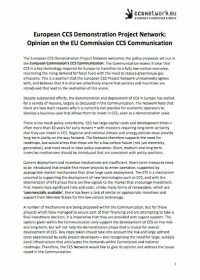 This report summarises main topics raised in the second European CCS Demonstration Project Network thematic workshop on CO2 transport held during the Network Knowledge Sharing Event in Stavanger (Norway) on 23-24 October 2013, hosted by the Sleipner Project (Statoil). 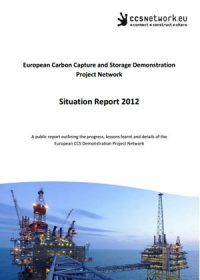 The European Carbon Capture and Storage Demonstration Project Network's Situation Report 2012 is a publication from a community of large scale projects dedicated to knowledge sharing (the Network). This report is intended for those interested in some of the specific technical, regulatory and project management considerations of carbon capture and storage (CCS) as a large-scale, low-carbon technology for the electricity generation and industrial sectors (steel, iron, chemical, methanol, gas process, cement, etc.). This report provides both a brief outline of the major elements within the development and running of a CCS project, and specific details generated by the Network. While a number of thematically specific reports are regularly made public by the Network, this report attempts to provide an overall outline of the technical details, lessons learnt, challenges and progress facing the carbon capture and storage (CCS) projects within the Network. The Situation Report 2012 covers developments during 2012. Primarily drawing on the data provided by the projects within a six monthly survey, information is also taken from the eight knowledge sharing workshops held by or with the Network, and specific reports generated by this body of large-scale projects. 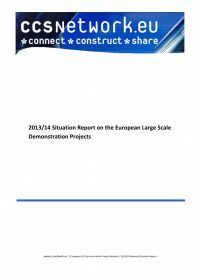 This report summarised the proceedings of the Storage Thematic Workshop held at the knowledge sharing event of the European CCS Demonstration Project Network in Stavanger on the 23rd and 24th of October 2013. 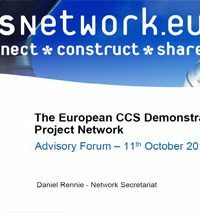 A recent presentation by the European CCS Demonstration Project Network, providing a brief overview of its member projects, and highlights some of the main challenges facing the development of carbon capture and storage projects within Europe. 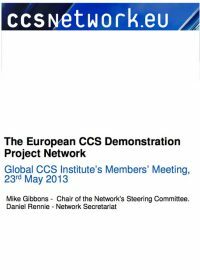 On 27 March 2013, the European Commission launched a Consultative Communication on "The future of Carbon Capture and Storage (CCS) in Europe" [COM(2013) 180], with the aim of initiating a debate on the options available to ensure that it is swiftly deployed. The European Carbon Capture and Storage (CCS) Demonstration Project Network provided a response to this Communication, commending the European Commission for its recognition and support of CCS, as a key technology that will allow Europe to reach its environmental objectives, stimulate job creation, and generate a sustainable economic and industrial base. While more details are provided in the report itself, overall the Network felt that there are two main reasons why it is currently not possible for economic operators to develop a business case that allows them to invest in CCS, even at a demonstration scale. There is too much policy uncertainty; and current deployment and incentive mechanisms are insufficient. Nevertheless, the Communication represents both recognition of the challenges being faced, and an opportunity for the community to collectively progress the deployment of this key technology.